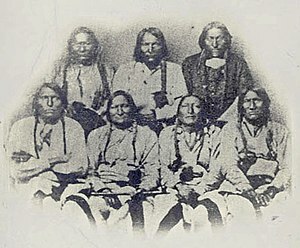 A delegation of Cheyenne, Kiowa, and Arapaho chiefs at Denver, Colorado on September 28, 1864. Black Kettle is second from left in the front row. The Colorado War was fought from 1863 to 1865 and was an Indian War between the Cheyenne and Arapaho tribes, against white settlers and militia in the Colorado Territory and adjacent regions. The Kiowa and the Comanche played a minor role in actions that occurred in the southern part of the Territory along the Arkansas River, while the Sioux played a major role in actions that occurred along the South Platte River along the Great Platte River Road, the eastern portion of the Overland Trail. The United States government and Colorado Territory authorities participated through the Colorado volunteers, a citizens militia while the United States Army played a minor role. The war was centered on the Colorado Eastern Plains. The war included an attack in November 1864 against the winter camp of the Southern Cheyenne Chief Black Kettle known as the Sand Creek massacre. The battle, initially hailed in the United States press as a great victory, was later publicly condemned as an act of depraved genocidal brutality. The massacre resulted in military and congressional hearings which established the culpability of John Chivington, the commander of the Colorado Volunteers, and his troops. The war was fought over the ability of the North American Plains tribes - mainly the Cheyenne and Arapaho - to maintain control of the bison migration grounds on the Great Plains in the upper valleys of the $3, Republican, Smoky Hill and Arkansas River valleys, at the edge of the plains where they met the Rocky Mountains. In the first Treaty of Fort Laramie (1851), the Cheyenne and Arapaho had agreed to accept as their designated hunting grounds the Eastern Plains between the South Platte and Arkansas Rivers. The area was of little use to the American colonists before 1859, when the Colorado Gold Rush brought the first large numbers of settlers to the Colorado Piedmont along the mountains, inundating the designated Native American lands with settlers and prospectors. The new settlers demanded that the US government extinguish the Native American claims and in the autumn of 1860 federal agents reopened negotiations with factions of the two tribes at a council on the Arkansas River. At the council, in the Treaty of Fort Wise some of the Cheyenne and Arapaho agreed to surrender all their former hunting lands except for a small Indian reservation along the Arkansas River between the northern boundary of New Mexico and Sand Creek. Moreover, the tribes would be converted from nomadic hunting to a farming lifestyle. The new reservation, instead of being an open hunting territory, would be surveyed and divided among the tribal members, with each member receiving 40 acres (160,000 m²) of land. Moreover, the federal agents promised that each tribe would receive a US$30,000 subsidy for 15 years, as well as a grist mill, saw mill, and schools. The leader of the Cheyenne who signed the treaty was Black Kettle. The policy of promoting a peaceful transition to farming, to which the tribes agreed, was thwarted in many cases by mismanagement and malfeasance of the politically appointed federal agents. One notorious example was Samuel Colley, the federal agent of the Upper Arkansas during the early 1860s, who became known for his misappropriation of tribal goods, which he sold through his son Dexter, a trader. The conflict occurred during the last two years of the American Civil War. The same units of the 1st Colorado Volunteers of the US Army that fought in this war also spearheaded the Union counterattack in the New Mexico Campaign against the Confederate Army. The war was initiated in April, 1864 without warning by the whites, for the purpose of driving the Indians into a reservation by force, but following minor successes against small bands of surprised Indians it became a defensive battle against intense Cheyenne and Arapaho attacks on travelers on the Overland Trail along the South Platte. By the early 1860s, relations between the Sioux and the United States on the northern Great Plains had deteriorated substantially (see Dakota War of 1862). Prior to this time, white emigrants passed relatively harmoniously through the area (known scornfully as the Great American Desert) on their way along the California, Mormon, and the Oregon Trails. After 1860, the discovery of gold in the Rockies, as well as the growing westward encroachment of homesteaders across the 100th meridian west, led the Sioux and their related tribes to progressively resist further white use of the area. Especially troublesome from their vantage point was the slicing up of the bison herd by the increasingly heavily used trails, as well as the development of new ones that further sliced the herds. The Colorado War marked the spreading of the trend among the Plains Tribes southward along Rockies, to the area passed by the trails. As a result, the United States Army, by then charged with overseeing the emigration routes, shifted the trails southward along the South Platte across present-day northeastern Colorado, then crossing up to the Laramie Plains along the trail followed by the Overland Stage Line. The Cheyenne and Arapaho had previously yielded a large area of the Eastern Plains in 1861 (largely to make room for the gold rush). The increased traffic in the area resulted in attacks by, most notoriously by the Kiowa, who were regarded as historically one of the most antagonistic tribes to white encroachment of any kind. The Cheyenne and Arapaho, a pair of closely related Algonquian-speaking tribes who migrated westward from the Great Lakes area in the 18th century, were regarded as not as interested in conflict with the whites. They were somewhat caught in the crossfire of the war, but ironically suffered the most notorious losses. The participation of the U.S. Army in the war came to be seen as particularly brutal, forcing the Congress to take an official position condemning the actions of Colonel John Chivington of the Colorado Volunteers. Initial reports in the Rocky Mountain News had hailed Chivington as a great hero. Later more accurate accounts of the battle by survivors on the Cheyenne-Arapaho side reached the U.S. press. The evidence was enough to force Congress to hold hearings on the brutality in the spring of 1865. The Native American version was corroborated by a white Indian agent who survived the battle, whose testimony was printed in the Congressional Review as one of the most critical pieces of such testimony entered into the public record. A portrait of Edmond Guerrier. Guerrier was the son of Frenchman William Guerrier and Walks In Sight, a Cheyenne. Guerrier provided testimony to Congressional investigators at Fort Riley, Kansas in 1865 concerning the Sand Creek Massacre. The Arapaho, who were largely nonhostile throughout the war, were forced to give up their last territory within the State of Colorado, as were the Kiowa and Comanche. The tribes were forced to Indian territory in present-day Oklahoma. As a result, the only Native American presence remaining in the state was the Utes, regarding whom the U.S. recognized a claim to all lands west of the continental divide. U.S. Army operations during the war were conducted largely out of Fort Laramie, the regional headquarters of the Army. In the fall of 1863 the fort was commanded by Lt. Colonel William O. Collins of the 11th Ohio Volunteer Cavalry. His son Caspar Collins (for whom Fort Caspar was named) would later be killed in action against the Sioux nearby along the North Platte River in present-day Wyoming. Upon the initial relocation of the stage and emigrant routes southward to Colorado, relations were relatively peaceful between the U.S. and the intermixed tribes of the Arapaho and Cheyenne (they tended to live in bands of their own tribes, but in mixed proximity of camps of bands of the other). The Arapaho wintered in large villages along the Cache la Poudre River where it emerges from the Laramie Foothills. The mountains just to the west were the firm possession of the Utes, who were descendant of the Uto-Aztecan people who had occupied the area for over a millennium. The Army established Camp Collins, named for the Fort Laramie commander, on the banks of the Poudre near present-day Laporte in early 1864. After a devastating flood in June, the Army relocated their camp southeast to high ground on the Poudre at present-day Fort Collins. The camp was initially occupied by the 11th Ohio Volunteers, and later by elements of the Kansas Volunteers, both of which were shifted to other duties. The Colorado Volunteers later occupied the post and would see much action in the southeastern areas of the state. The attacks on the stage routes led to a general hostility among the whites in the new Colorado Territory against all Native American presence, no matter how cooperative and benign. ↑ "Beginning at the mouth of the Sandy Fork of the Arkansas River and extending westwardly along the said river to the mouth of Purgatory River; thence along up the west bank of the Purgatory River to the northern boundary of the Territory of New Mexico; thence west along said boundary to a point where a line drawn due south from a point on the Arkansas River, five miles east of the mouth of the Huerfano River, would intersect said northern boundary of New Mexico; thence due north from that point on said boundary of the Sandy Fork to the place of the beginning." A Colorado History, Carl Ubbeholde, Maxine Benson, Duane A. Smith ISBN 0-87108-923-8, Pruett Publishing, Boulder, Colorado (first edition 1965).